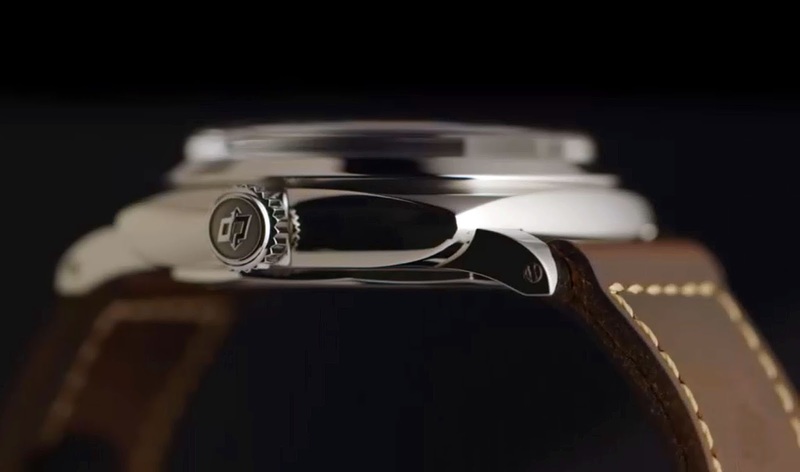 It is hard to believe, but after all these years of waiting, Panerai finally brought the watch to life which was known as the "Small Egiziano" which was know in vintage Panerai parlance by its reference number of Reference 6154. 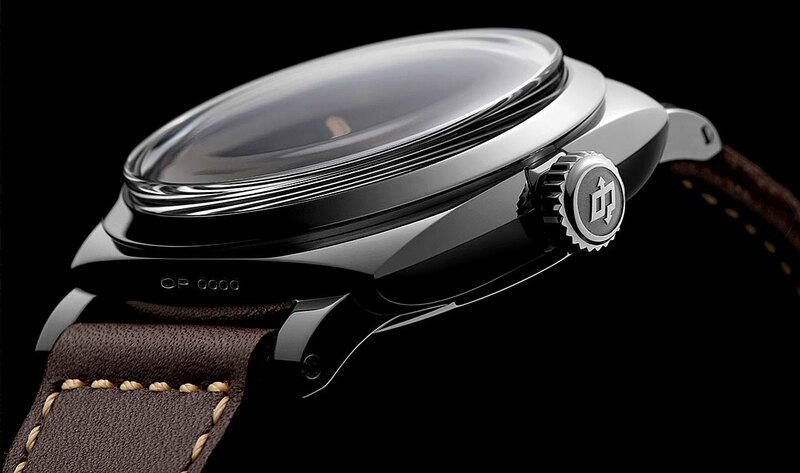 The only challenge with this watch is that Panerai is only making 1000 units. 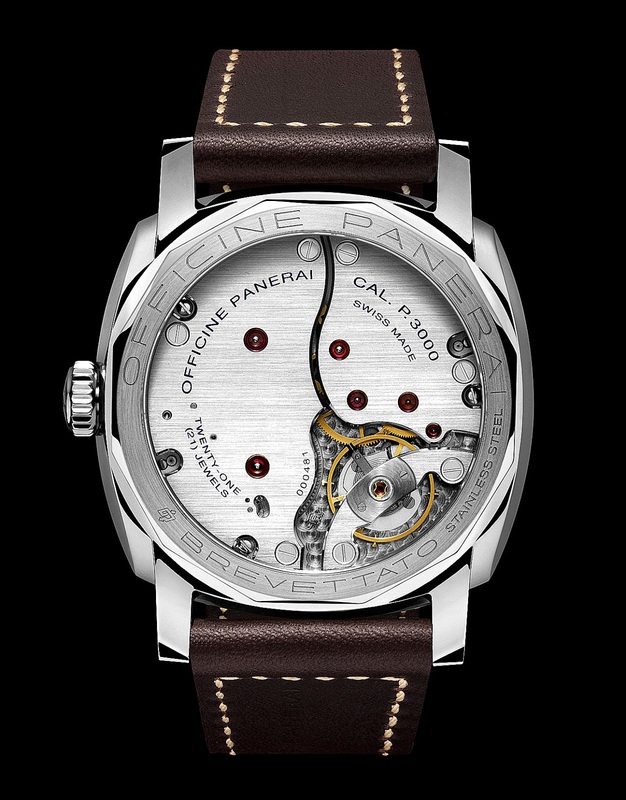 Panerai has named this model the PAM00587, and you can learn more about it on Panerai.com. 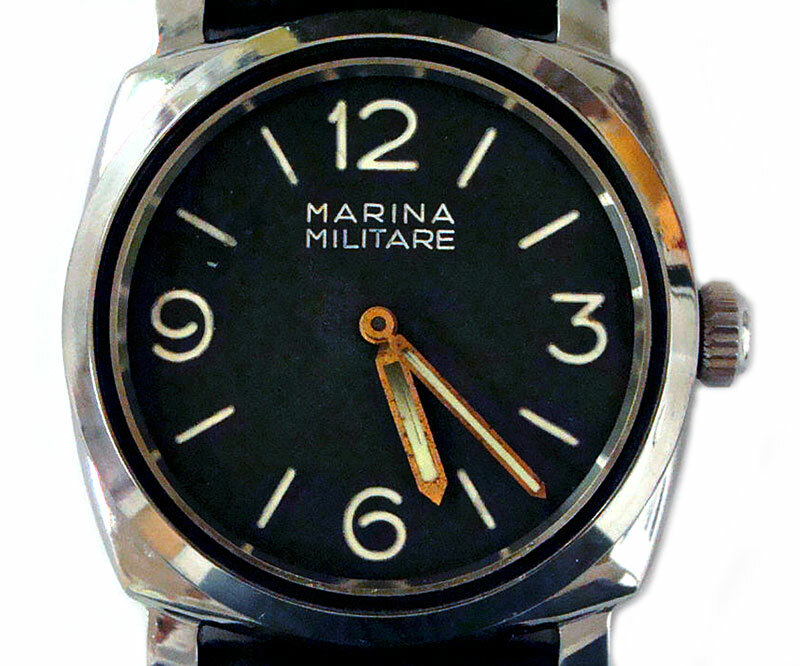 This Italian beauty has all the vintage characteristics including a plexiglass crystal, and from what I can tell it appears to basically be a PAM00372 without the trademark Panerai half-crescent crown guard, and with a Marina Militare dial designation instead of a Luminor Panerai. 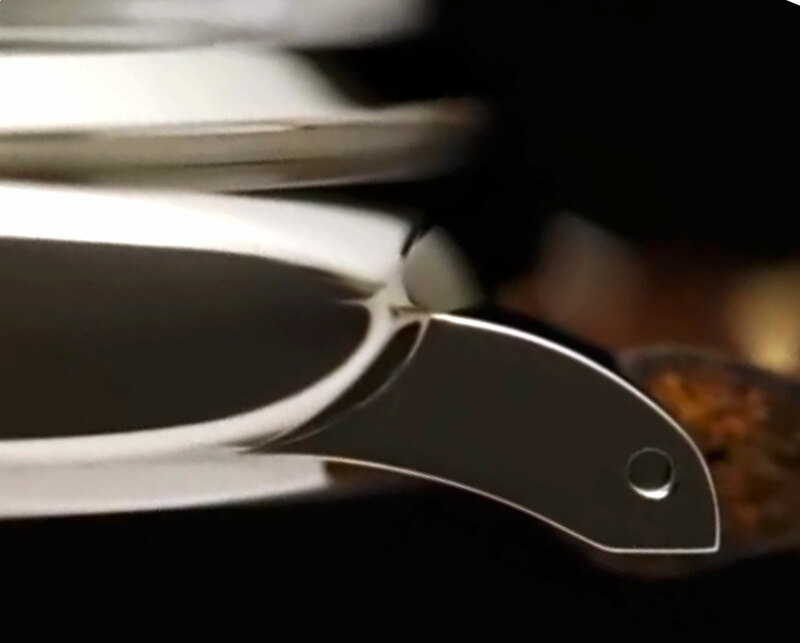 It also features sharper pencil hands, which differ from the PAM 372 hands. This watch design is highly authentic, and if you look at the photo of me on the right side of this page, and click on it to see it better, I am actually wearing the exact vintage Panerai this watch is based upon, which is a Rolex made Reference 6152/1 with the Marina Militare dial designation. 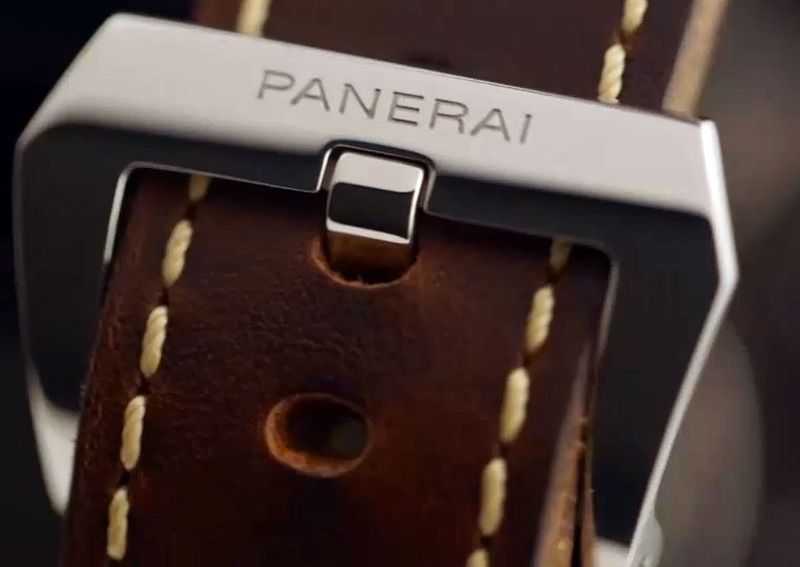 Panerai's choice of the dark chocolate natural strap was superb. 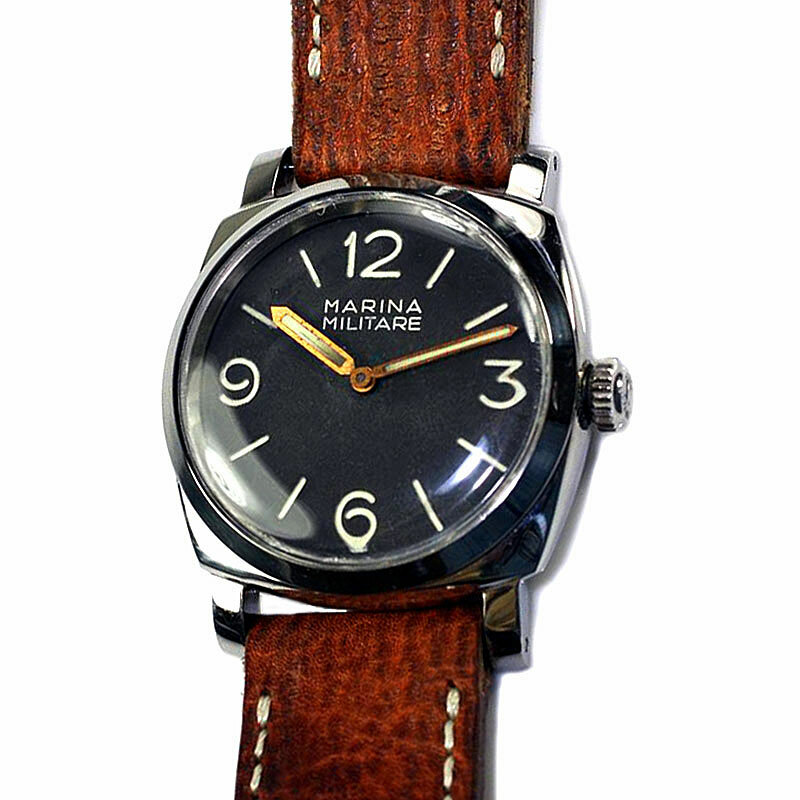 This gives the watch a serious vintage vibe that plays beautifully off the base dial. 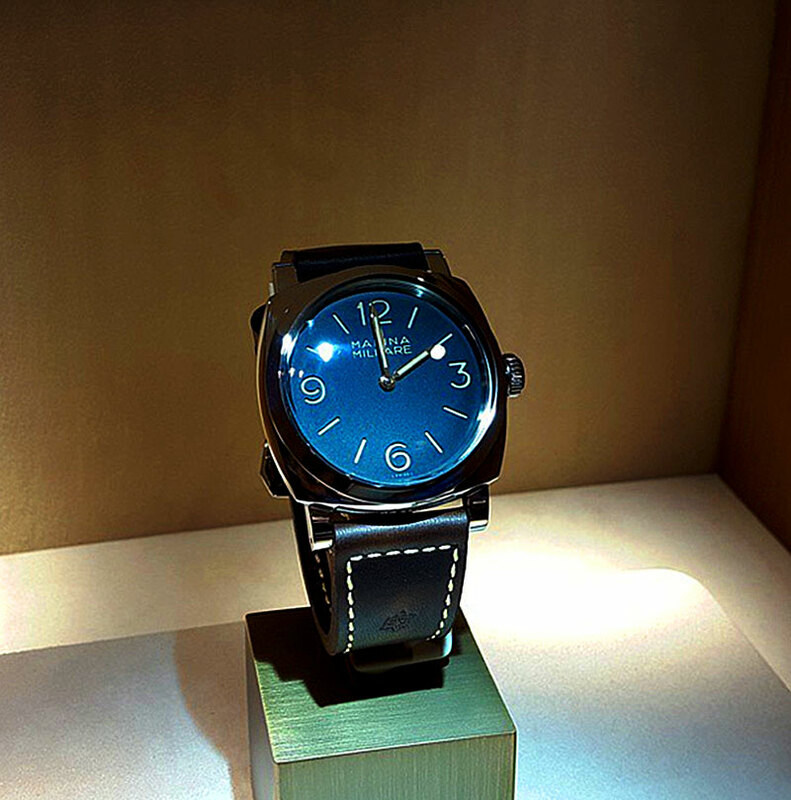 Panerai formally introduced this watch at the Watches & Wonders trade-show in Hong Kong, which is now the sister trade-show to SIHH, which occurs annually in Geneva. The Watches & Wonders show is relatively new, but the idea is that it it allows Panerai and all other Richemont brands the ability to not have to introduce all of their new models annually at SIHH. Instead the can divide it up, and Watches & Wonders is focused more on the Eastern market, whereas SIHH is focused more on the Western Market. I covered this years SIHH trade-show live from Geneva, Switzerland and tie was absolutely fascinating. Below is a photo of the actual PAM 587 in the flesh, which was taken recently. 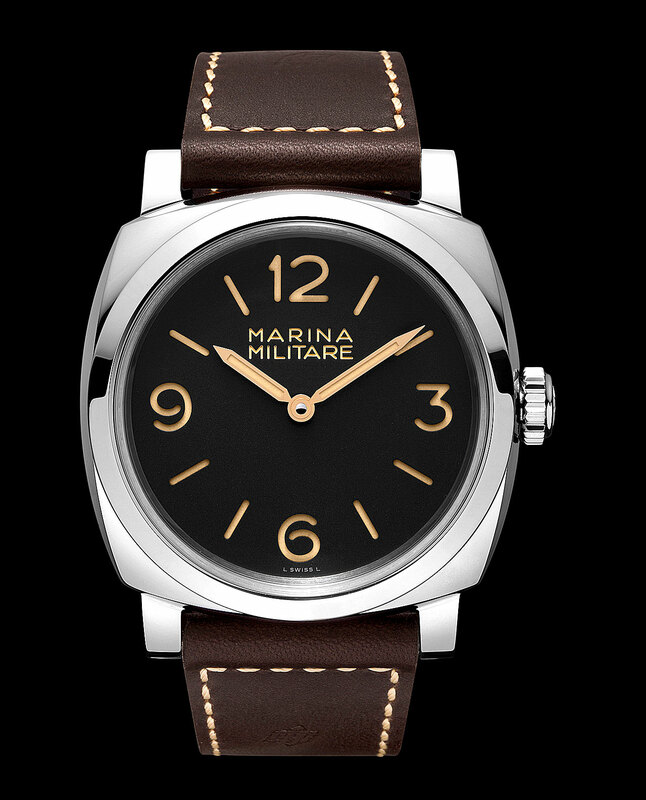 Inevitably Paneristi will compare the new limited edition PAM00587 with the existing standard edition Panerai PAM00372. From what I can tell from analyzing the photos, the bodies are extremely similar, with the difference of the lugs being beefier on the 587, as well as the crown-gaurd v. the big 8mm crown. As I mentioned earlier, the hands on the PAM 587 are different, and a not only arguably more authentic but better in design. Specifically, some people have argued that the hands on the PAM 372 are too short, especially compared to the hands on the vintage Panerai Reference 6152 it is based upon. The the hands on the 587, are not only longer, but also sharper looking, which synergies perfectly with the late Art-Deco Populuxe design style of the dial and case, which reeks of 1950s masculine style. The 587 also looks sharper, cleaner, longer and leaner, simpler, more streamlined, and less chunky than its sibling 387. In my opinion, the PAM 587 is a pure and absolute Minimalist Masterpiece, and it looks less affected, contrived, and obvious than the 372. Don't get me wrong, I LOVE the 372, and wear one, but the 587 is an example of less, really being more. The 372 is more Sylvester Stallone/Rambo, and the 587 is more Cary Grant/James Bond. The suggested retail price for the 587 is $10,100. 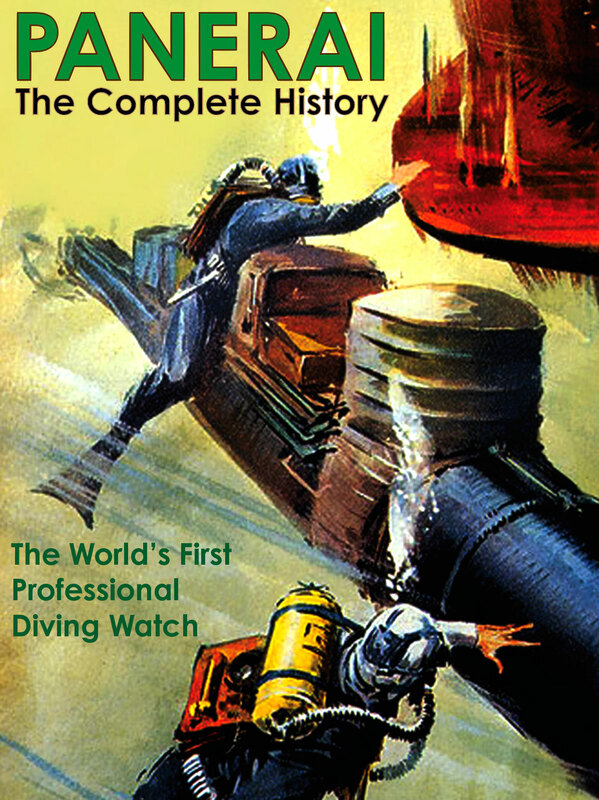 In order to properly contextualize the significance of the advent of this new model, I decided to add some previously published material that originally appeared on Jake's Panerai World in a little over a year ago in August, 2013. 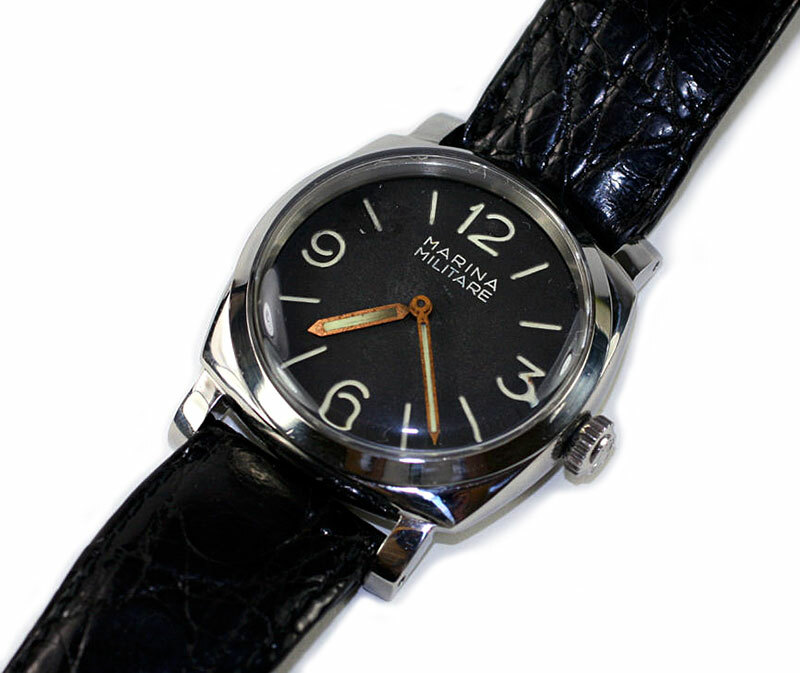 This next story covers the model the Panerai PAM00587 is based upon. At the end of the story I will add another side by side comparison. 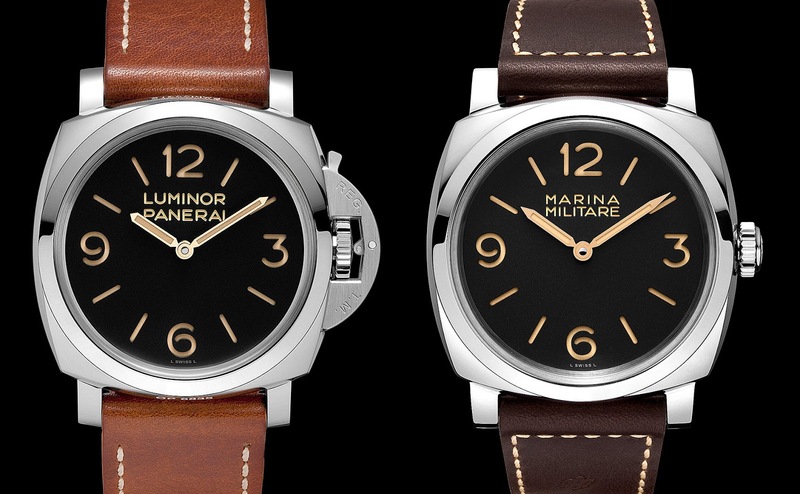 Let's begin with a side by side comparison of the original vintage Panerai next to the new model. On the left we have the Reference 6152/1 next to the modern PAM00587. Obviously the PAM387 has a stunningly warm and beautiful dial and hand color combination. 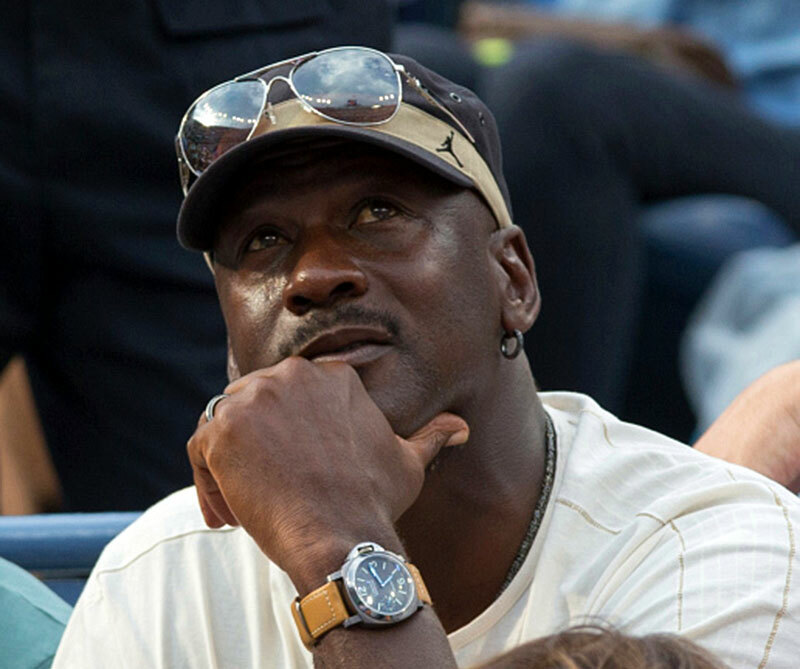 Some people say they think that giving new watches a more patina'd look is inauthentic, but I could not disagree more. I think it is like a beautiful suntan. 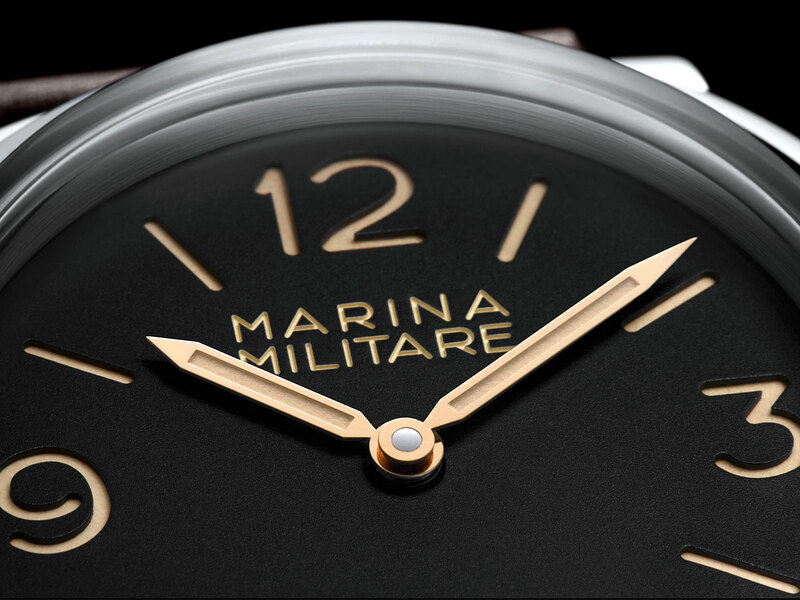 Notice the PAM 587 "MARINA MILITARE" dial designation uses a slightly larger font, which makes it just a tad bit more legible. 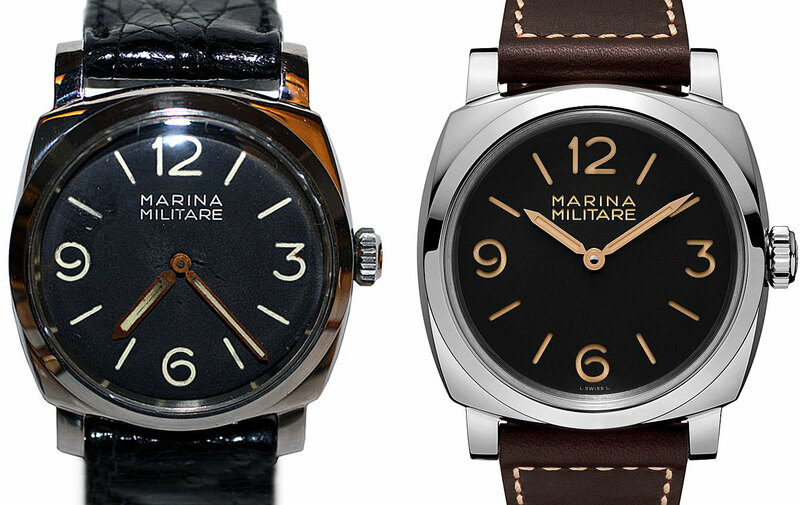 On the 6152/1 on the left, we see the "M" in "Marina" is to the right of the 11 baton marker, and on the PAM 587 ins is definitely further over to the left. 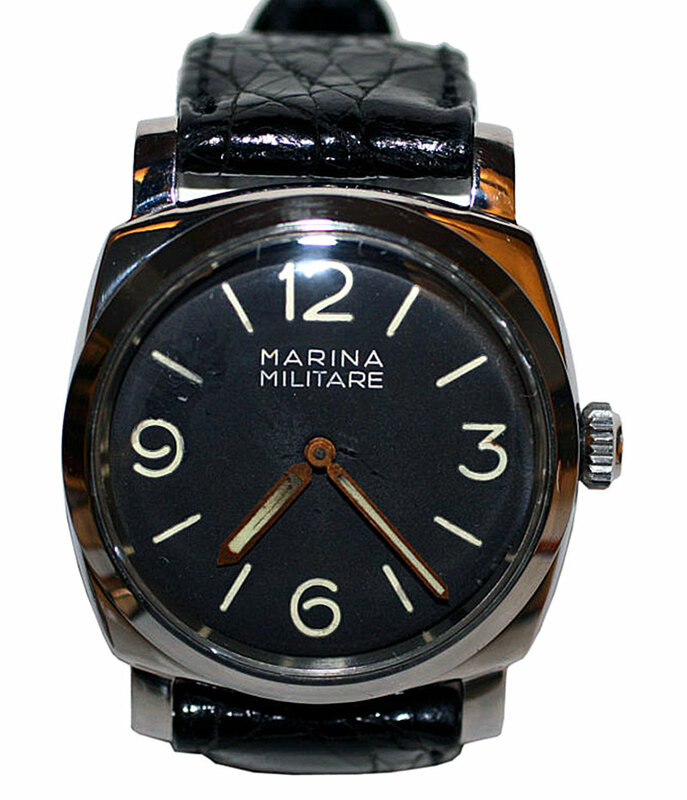 Also, the 587 "MARINA MILITARE" dial designation is etched into the sandwich dial, and it is colored similarly to the ecru lume and gold hands. Ironically, the original 6152 has the hands found of a modern PAM 372, but I like the sharper pencil hands on the new PAM 587. In my personal opinion, Panerai has done an excellent job with the design of this beautiful vintage inspired new limited edition model!!! Today we are going to closely examine a stunningly beautiful vintage Panerai that was made in the late 1940s for the Italian Royal Navy. 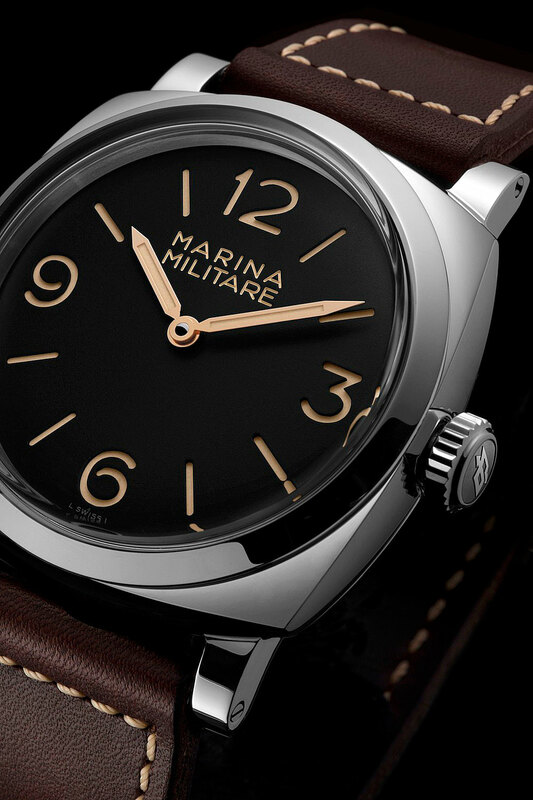 This watch has the Italian Royal Navy designation on the Dial which reads: "MARINA MILITARE." 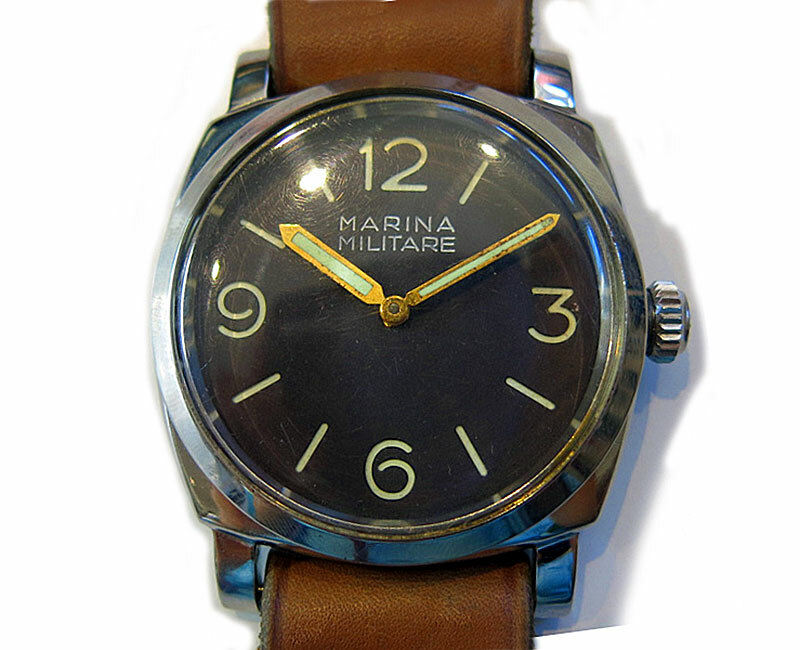 In case you are not familiar with the vintage Panerai watches with the "MARINA MILITARE" designation on the dial, they were made for the Italian Royal Navy, and lack any kind of "Panerai" designation on the entire watch. 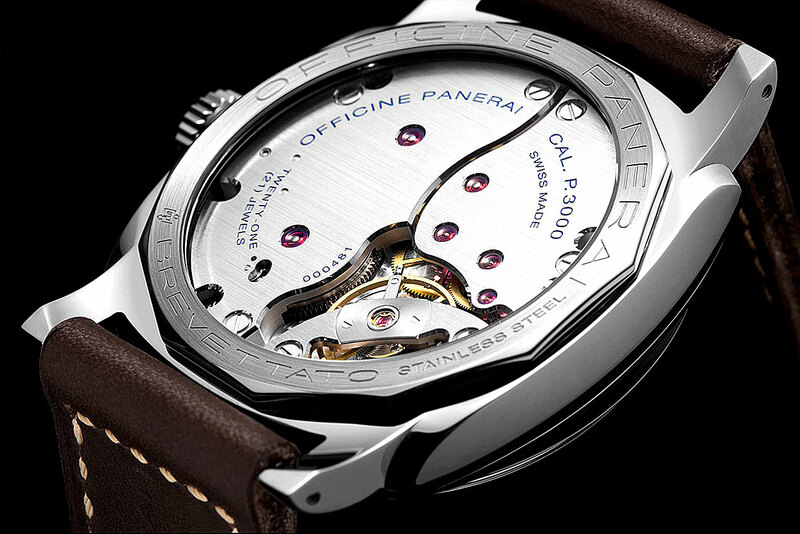 In other words, this watch is 100% pure Panerai, it just does not say so on the watch. All the photos in this article were taken by Matthew Bain, and they showcase a very, very rare vintage Panerai model which has a "MM" engraving on the back, with a military issue number. It appears that all the parts on this watch are original. Notice the hands have an interesting patina where they have oxidized over time and the hour hand almost has a sunburst pattern on it. This watch has the serial number 124XXX engraved between the top lugs, and the 6152 1 Reference number engraved between the lower lugs. The photos below show this beauty from both side views of the case. 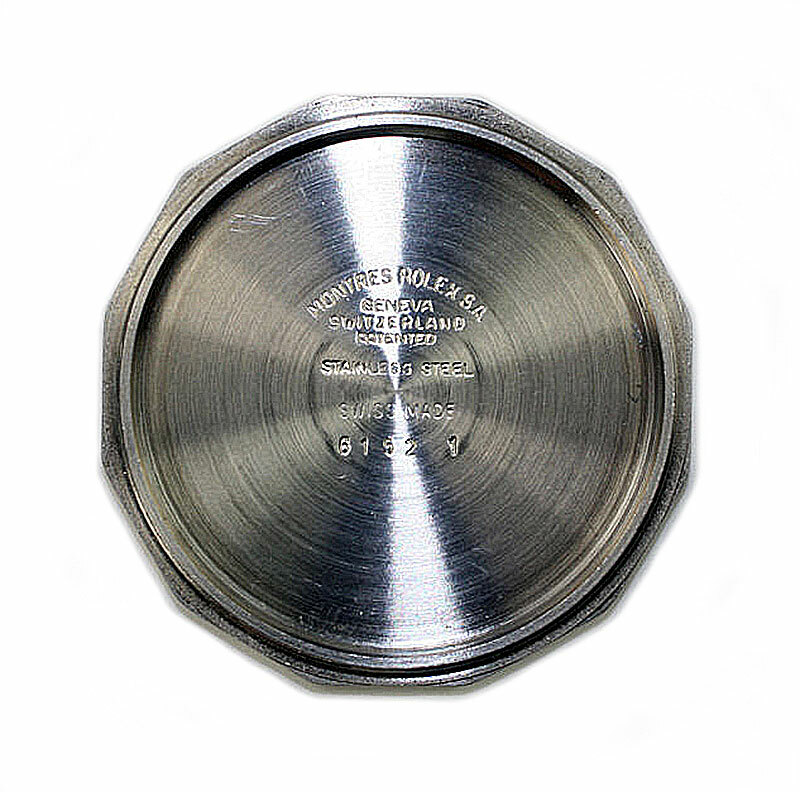 The first image below shows the 8MM Rolex BREVET winding crown. Keep in mind that Rolex made this watch for Panerai, which explains why the winding crown has the Rolex five-finger hand winding crown. 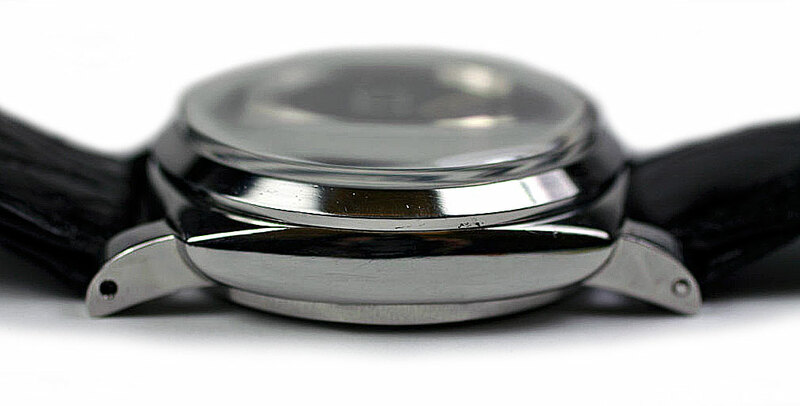 From a design perspective, this watch is outrageously beautiful in its simplicity. 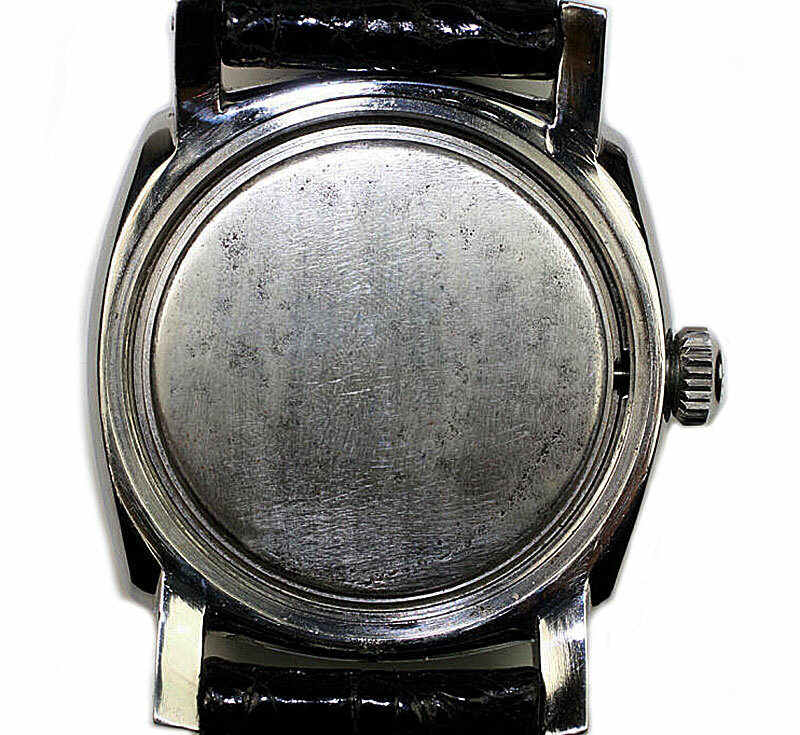 The 1940s watch case was super-streamlined in every way, yet very masculine. 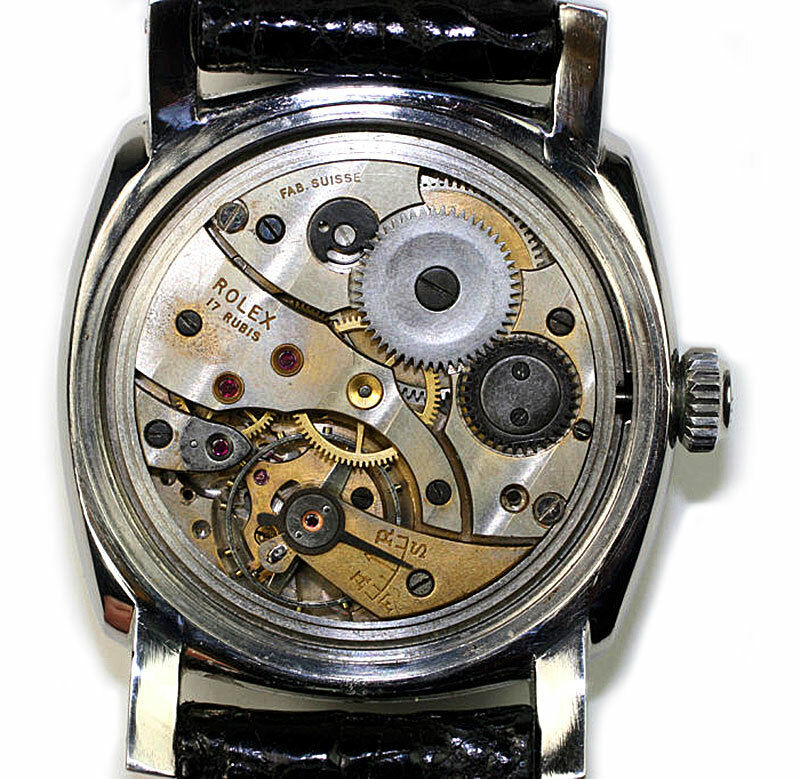 The case is almost identical to the 6152 which has the "Tight Seal Device", but it has the Rolex Brevet winding crown instead. In my personal opinion, the only vintage Panerai watch ever made, that is more beautiful that this, is the super-iconic Radiomir Panerai Reference 6154 "Small Egiziano" which was made for the Egyptian Navy. The Panerai 6152/1 and the Panerai 6154 are remarkably similar in case design, but the 6154 is skinnier and even more streamlined that the 6152/1. 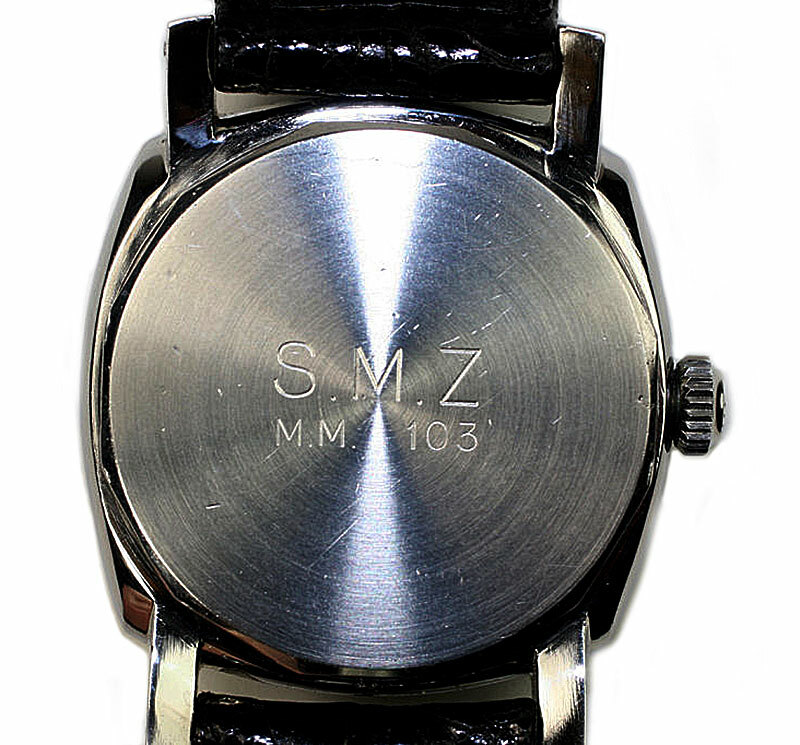 The photo below shows the 12 sided case-back which has the original Italian Royal Navy Military Issue Number engraving which reads "S.M.Z" on the first line, and "M.M. 103" on the bottom. The next image below shows the Panerai 6152/1 with the case-back removed, and it appears to have a movement cover which may have been designed to improve anti-magnetic performance. In the next photo below, we see the 17 Ruby Mechanical Rolex Movement, which is remarkably simple, sturdy, accurate, and durable. Pictured below we see the inside of the screw-out case back, which has twelve sides. Notice inside is says "Montres Rolex S.A., Geneva, Switzerland, Patented. Stainless Steel. Swiss Made. 6152 1. One of the most interesting details that sets every single vintage Panerai apart, is how different the patina is, both on the dial and the hands. The unique patina on everywatch is unique and almost like a fingerprint. This particular watch lume has not darkened or changed very much. The Arabic numeral markers are still bright white, which give the watch a precise, fresh look. The hands also look really cool. 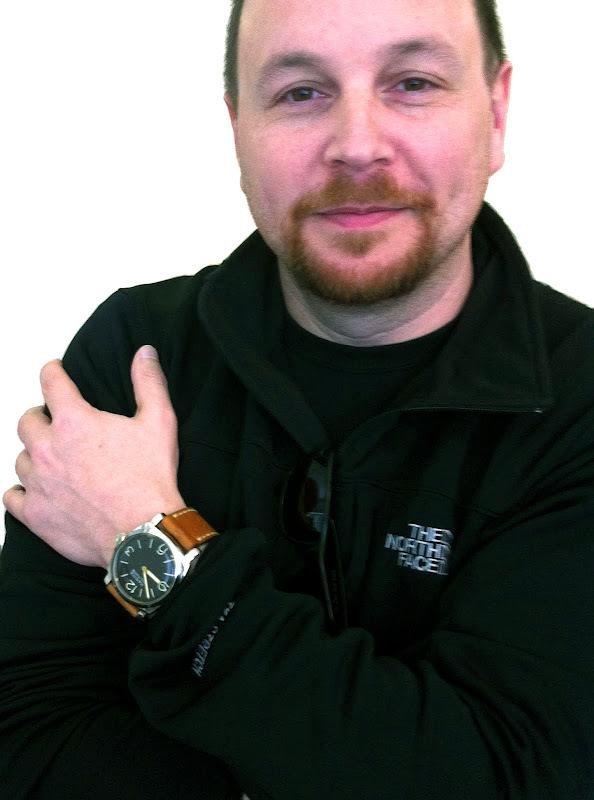 If you wonder what I look like, here is a photo of me wearing an original Rolex made Panerai 6152-1 with the Marina Militare dial. 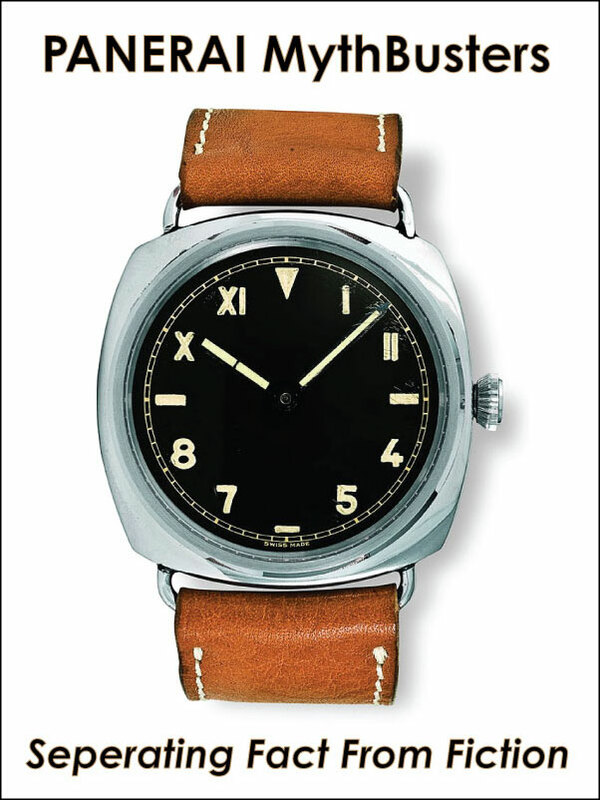 This watch was made in the late 1940 or early 1950s an is one of my absolute favorite Panerai watches of all time. 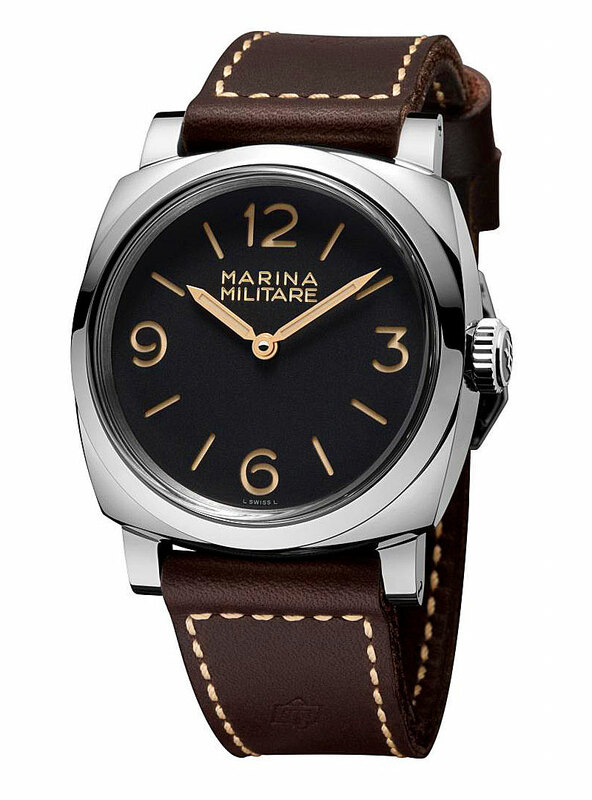 As previously mentioned if you look closely it has the Marina Militare dial designation as is the model the new PAM00587 is based upon. So just to be crystal-clear, the watch I am wearing in the photo below is NOT the new PAM00587, but the Original vintage Panerai Reference 6152-1, which the PAM 587 is modeled after. One of the most interesting things about all the vintage Panerai models is how each one has developed a unique patina, as see in contrasting the different version as seen above and below. The one above has greenish lume, and the one below has very white lume, and the hands look like they have have some radium burn or tarnishing. I took the photo below of my 372 with the new iPhone 6 Plus, which in my mind are similar in the sense they are both large, masculine and very cool looking. 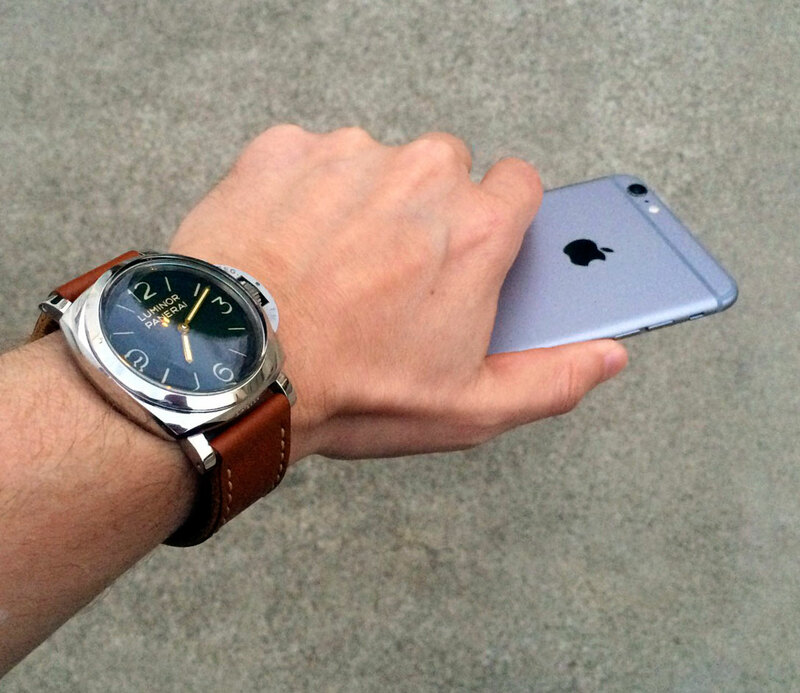 By the way, Jake's Panerai World looks amazing in Safari on the iPhone 6 Plus! 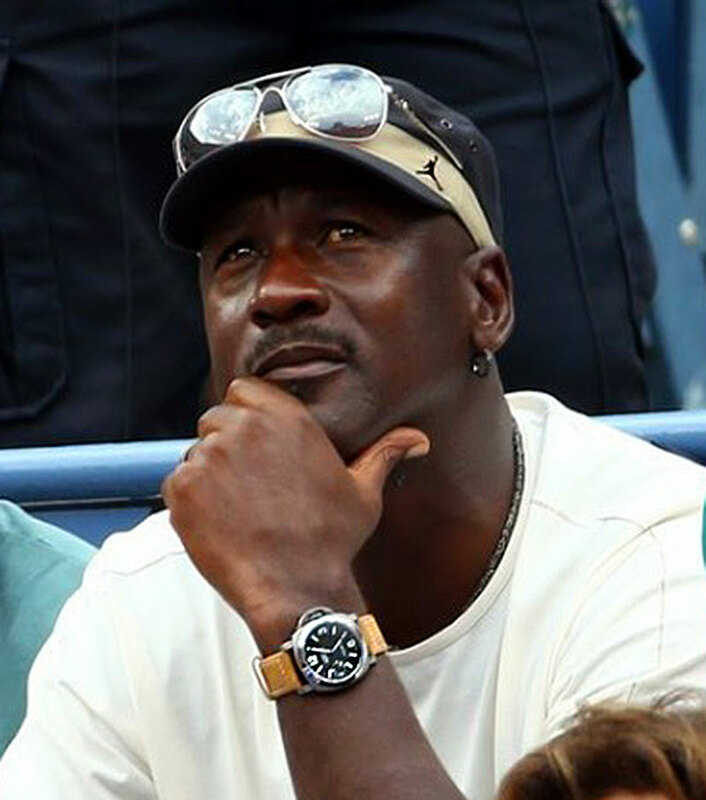 The photo below shows Michael Jordan rockin' a Panerai PAM 172, and it was taken today at the U.S. Open Tennis Semi-Finals.